Bar food keeps getting better and better, and the bars in which you find it more and more unexpected. Take, for instance, the Long Island City cocktail den Dutch Kills. That is the home of Hendu’s, a one-man sandwich shop that’s been operating out of the bar’s kitchen since December. The man behind Hendu’s is Bill Henderson, a Bronx native and former M. Wells line cook, with a knack for making the sort of outsize heros you’d expect to find at a longshoreman’s saloon, not a genteel temple of pre-Prohibition mixology. Henderson’s culinary trajectory hasn’t followed the standard path. Trained as a massage therapist, he gravitated to cooking in unusual places: first, for the sisters of Notre Dame at the Villa Maria Academy in the Bronx (no heros, he says, but Friday night was pizza night), then cooking school, followed by his tenure with the freewheeling M. Wells crew, both at their art-museum cafe and steakhouse, just down the road from his current gig. There are four sandwiches on the Hendu’s menu with a few specials rotated in, and every one of them is an absolute knockout. Even the dubious-sounding beets with goat cheese blew the Underground Gourmet away. The lumpy beets are dressed in vinaigrette and roasted long enough to turn dense and hearty, then layered with goat cheese and a walnut-arugula pesto that you’ll find yourself craving on all subsequent, pesto-less beet-and-goat-cheese sandwiches. 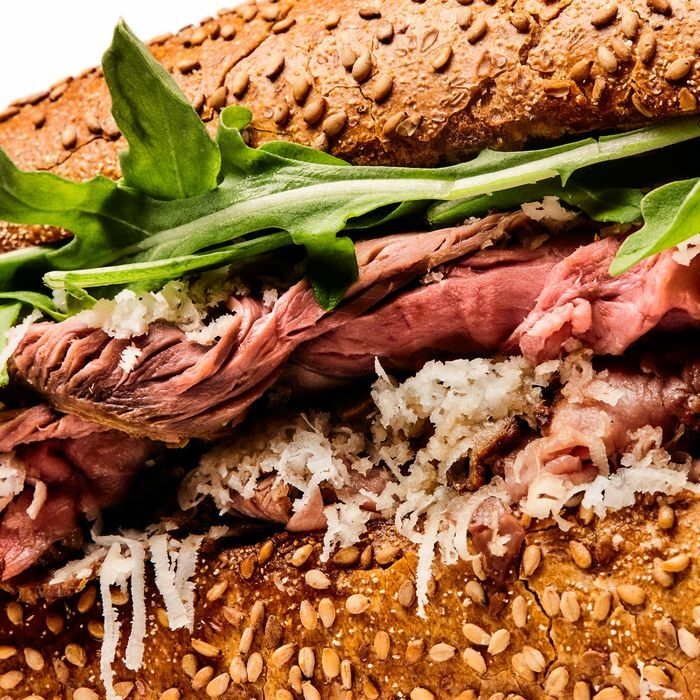 Still, to capture the essence of Henderson’s sandwich mastery, you have to sample his pièce de résistance, the hot roast beef, which he brines, cooks, shaves thin, and douses in veal-stock gravy, then blitzes with fresh horseradish. Henderson makes everything from scratch except the terrific sesame-­seed hero rolls that he sources from A & M Bakery in Mt. Vernon, then lavishly spreads with garlic butter and oven-toasts until they’re as crunchy as a Stella D’oro breadstick. The guy even personally delivers the butcher-paper-wrapped torpedo missiles to your cocktail booth, albeit in the manner of a paperboy flinging the Daily Gazette onto a doorstep.